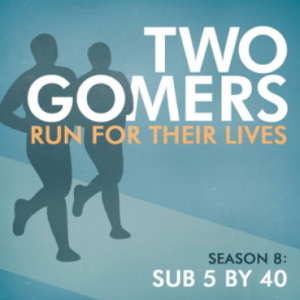 As promised, the Gomers’ monthly off-season update podcast is here! And for the first time, the guys are recording in the same room – and that room is in one of the Gomers’ actual homes. Flagstaff is the place, Steven’s home turf, though only a month before they were together in Tampa. The guys relate their stories of runs in both places, and ask themselves if the grass is, in fact, greener. Join the guys as they talk about their months in review, Queen Amidala’s vocal prowess, alternate endings to the Back to the Future movies, what’s coming for Season 5, and the most miraculous substance ever offered in packet form. But what would it taste like on a Five Guys burger?! Thanks for listening, and Happy Running!